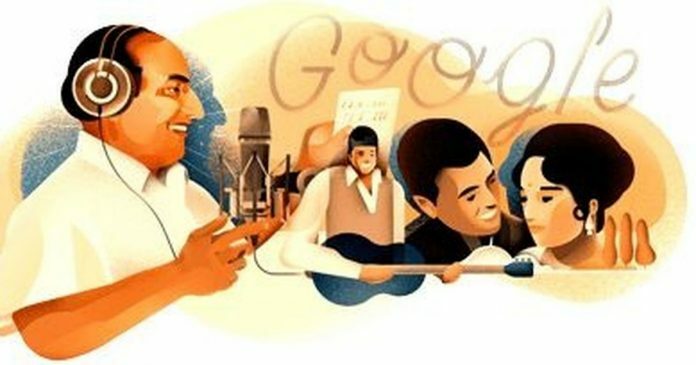 New Delhi: World’s largest search engine Google on Sunday paid tribute to legendary playback singer Mohammed Rafi with a doodle on the occasion of his 93rd birth anniversary. Mohammed Rafi is hailed as one of the most versatile singers of all times. Nicknamed Pheeko, Rafi began singing by imitating the chants of a fakir on the streets of his village, Kotla Sultan Singh. At 13, he made his stage debut with his first public performance in Lahore. The big break for Rafi in Bollywood came through his duet song “Aji dil ho kaabu mein to dildar ki aisi taisi” for the film “Gaon Ki Gori”. From there, Rafi went on to sing at least 7000 songs across genres and languages. From classical music, patriotic songs, to romantic ballads and qawwalis, Rafi sang in Hindi, Konkani, Bhojpuri, Odia, Punjabi, English, Parsi and Arabic languages. He bagged his first Filmfare for “Chaudhvin ka chand ho” in 1960. He followed it up by winning five more Filmfare awards. The song “Kya hua tera waada” also fetched him a National Award in 1977. He was also honoured with the Padma Shri by the Government of India.